With a back drop of spectacular mountain views, this is a working farm that the Rappahannock River flows directly through. For over a decade Marriott Ranch has enrolled in voluntary conservation programs to protect the water resources on their property and improve the health of their cattle through conservation best management practices which provides and excellent opportunity to showcase conservation. 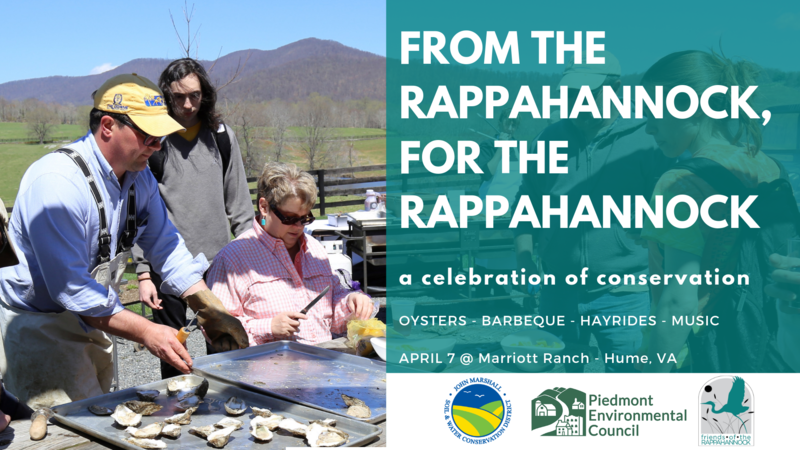 We will have Rappahannock River oysters from the Oyster Company of Virginia, catered barbecue from Marriott Ranch, local wines and beers from the Piedmont region, live music, hay ride tours of the property and conservation practices, fish shocking demonstrations from Virginia Department of Game and Inland Fisheries (DGIF), and more! Staff from a variety of conservation organizations will be available to answer questions and talk about local and regional environmental issues, land conservation, riparian buffers, and cost share programs available in the region. This year, special guest Deputy Secretary of Natural Resources Ann Jennings will join us. We look forward to seeing you there and if you have any questions please let us know.